Dwi Mukhi Ganesha is especially worshipped to get relief from Ketu related problems in horoscope or janam kundli. Many Hindus believe that worshipping two-face Ganesha changes luck and ushers is prosperity. A rare Dwi Mukhi Ganesha is worshipped in the famous Chintamani Ganapati Temple in Mandasur, Madhya Pradesh. The two faces of Ganesha faces the opposite direction. Red color dress adorns the murti. The color tone is blue-green. He has four hands holding ankush, pasha and gold filled kumbh. One hand is in Varad mudra. The nakshatra associated with Dwi Mukhi Ganesh is Shravan. When Chaturthi falls on Monday, the day is dedicated to Dwi Mukhi Ganesha. Financial problems will be solved especially legal issues related to wealth. All fight and problems in home will be solved. White color flowers are offered to Dwi Mukhi Ganesha. Chawal kheer or rice payasam is offered as Prasad or bhog. Shatawari is offered to two-face Ganesha to achieve peace in life and at home. 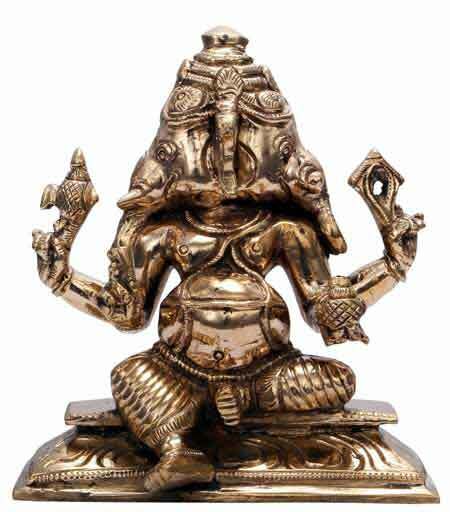 Dwi Mukhi Ganesha is also part of the 32 forms of Ganesha mentioned in Puranas.